Thinking and Drinking don’t usually go hand-in-hand, but in the case of an upcoming Windsor event, they most certainly do. 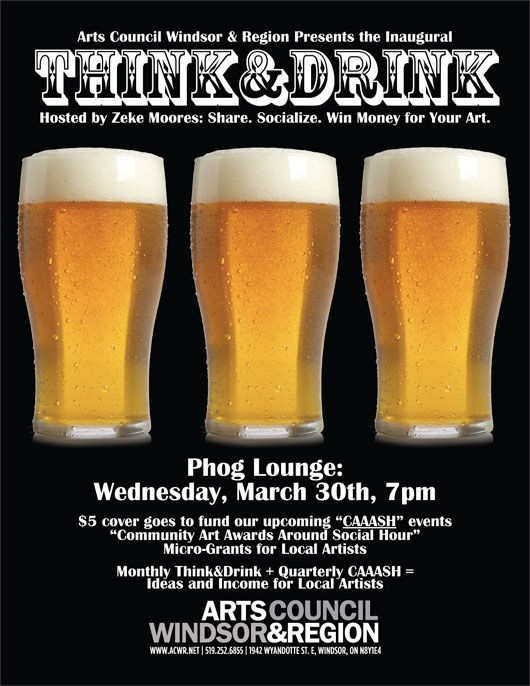 The Arts Council Windsor & Region is hosting Think & Drink tonight at 7pm at Phog Lounge. What’s Think & Drink? It’s a way for local artists to connect and brainstorm ideas for making the art culture in Windsor better. The Arts Council is also planning to host an event called CAAASH (Community Art Awards Around Social Hour). You’ve heard of this before — think about FEAST, SOUP, and Phog Philanthropy — basically, micro-grants for artists. At CAAASH, artists will be invited to make a 5-minute grant pitch. At the end of the night, everyone will be invited to participate in a silent vote, and the winner(s) will walk away with the cash that night. And the $5 cover charge at every Think & Drink builds the grant money pot and 100% of it gets handed over to the winning artist(s).